Join us on an adventure to a timeless destination, nestled in the beautiful highlands of Colombia - Salento. A truly authentic Colombian mountain town, Salento and its surrounding areas are home to some of the country’s most stunning views, outdoor adventures, and captivating cultures. Our days will begin and end at a one-of-a-kind private mountainside villa just outside of town; featuring expansive views of rolling hillsides, a large private garden, and spacious beautifully decorated rooms; “magical” is the best word to describe our home away from home. We will start each day with a morning revitalizing yoga session to prepare our mind and body for the exciting day ahead. After yoga and a delicious breakfast prepared by our private local chef, we will embark on one of our customized eco-adventures: awe-inspiring horseback rides across the Andean Cordillera, mountain biking, hiking through the world renowned Cocora National Park (home of 200 ft. Wax Palms), and taking a dip in hidden natural hot springs. At the end of the day we will wind down with a relaxing yoga session to reconnect and reflect on the experiences we just shared. This retreat is about feeling truly alive. 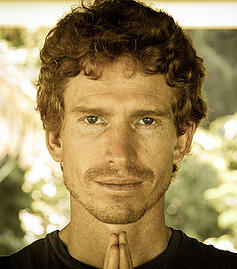 From the custom yoga practices, guided by the talented Brady Wilson, to our energizing adventures throughout the magical Highlands, we are honored to share this opportunity with you - to reconnect with the self, to live fulling in the present moment, and to experience the world through new and inspiring ways. 2019 is officially SOLD OUT. Contact us to learn about Colombia 2020. Daily yoga practices will be customized based on preferences of our group. Expect to find your flow, a meditative moment, or heart opening posture among beautiful vistas of the welcoming green Colombian Andes. Born and raised in Snowmass, in the heart of the Rocky Mountains, Brady was exposed from a very young age to the power and beauty of the natural world. He learned from his family and alternative education programs, ways to live harmoniously and enjoyably amidst the harshness of the elements. Through adolescence, Brady enjoyed a mildly famous career as a competitive aerialist snowboarder. After receiving a bachelor’s degree at Fort Lewis College, he became a Certified Yoga Instructor at Durango’s premier yoga studio: Yoga Durango. During his third year as an instructor, he was invited to be an assistant for an international Yoga Teacher Training program in Costa Rica at the Pavones Yoga Center, where he is currently completing his 500 hour certification. Among a variety of other activities, he is passionate about mushroom hunting, performance poetry, singing and dancing, and pretty much anything that involves being in the wilderness. Warm and welcoming, with a keen sense of humor and a love for adventure, Brady will lift your spirits and your hearts with his infectiously enthusiastic and optimistic outlook on life. Horseback riding in Salento, Colombia is something all travelers should experience during their visit to our beautiful country. The small town of Salento looks very much like an old western, cowboy town and it’s not uncommon to see people still riding horses to come into town. The stunning landscapes surrounding Salento make it a fantastic place for horseback riding. From coffee plantations, to waterfalls, to valleys there’s a huge number of things to see and trails to explore. There are several fincas in the area that offer coffee tours. Don Elias, is a small family-run organic plantation where you will be shown around the farm by Don Elias himself, who will explain and demonstrate the process of growing and roasting coffee. At the end of the tour, you will be invited to taste a cup of their delicious freshly roasted coffee. Salento is a fantastic location for mountain biking in Colombia. The beautiful, little town is surrounded by lush, green mountains with scenic trails for riding a bike. Mountain biking tours will take you through hills, valleys, rivers, and tremendous vistas along the way. They includes the bike, guide, technical support, water, food (depending on the tour) and entry to any coffee fincas you may visit. It is also possible during the full moon to take a nighttime ride by moonlight. Or you can cycle into the Valle de Cocora. Quite possibly the most remote and captivating hot springs we have explored, the termales near the town of Santa Rosa de Cabal are set in a highland tropical box canyon at the end of an exciting jeep road. Soak in natural rivers and pools set in an enchanted forest of lush green foliage, as well as luxurious man made spas all fortified with the purest water and minerals. In a country full of beautiful landscapes, Cocora is one of the most striking. It stretches east of Salento into the lower reaches of the Los Nevados ountains and national park, with a broad green valley framed by sharp peaks. Everywhere you'll see palma de cera (wax palm), the largest palm in the world (up to 60m tall). It's Colombia's national tree. Set amid the misty green hills, they are breathtaking to behold. ‘Cocora’ was the name of a Quimbayan princess, daughter of the local chief Acaime, and means ‘star of water’. The valley is part of the Los Nevados National Natural Park, incorporated into the existing national park by the Colombian government in 1985. Located just a short walk from the town of Salento, our home away from home in Colombia is a beautiful and spacious private property. Complete with multiple balconies to take in the gorgeous mountain vista, expansive gardens for meditation and connecting with nature, and a quintessential Colombian vibe throughout. Magical is the best word to describe our accommodations, as the beautiful inside decor compliments the breathtaking views around every corner. Each bedroom is delightfully decorated and is complete with a private bath with hot and cold water. Common areas include a full kitchen, comfortable living area (with indoor hammocks), outdoor balconies, gardens, and a special open patio ideal for yoga and meditation practice. Our private chef will be integrating a nutritionally balanced, organic and local ingredients with the delicious flare of the region. Expect hand squeezed juices made from Colombian tropical fruits you most likely have never heard of, all with detoxifying and vitalizing qualities, local meat and fish dishes, Colombian specialities made with a nutritious twist, and of course the best coffee in the world! Life Force can help you with booking information for the best travel and flight itineraries, hotels, restaurants, and activities during your stay in Colombia. Our pick up will be at the Armenia Al Eden aripot (AXM). Direct flights to AXM can be found on Spirit Airlines as well as non-direct on United, Avianca and others from most any major city in the US. A private shuttle service to our villa in Salento will be included in your retreat package. The shuttle will leave at 4:00 PM on March 23 and March 30. All the meet up details will be provided upon receipt of the initial trip deposit. A valid passport is required for all foreign visitors to Colombia. An entry visa is not required for American or Canadian nationals. Please inquire with the nearest Colombian consulate for entry requirements for other nationalities.